This post was inspired by a recent private tour I did with a client. I love to help people navigate and shop the garment district, and often help to teach them the garment district culture, so they know how to operate to get what they need. Since the readers of this blog are both shoppers and proprietors of businesses in the district, I cannot share some some of the specifics with you here (I'd have to whisper... and you're not within earshot), but here is some food for thought. Some of you know many of these answers already, and believe me, it would be nothing but helpful for you to comment publicly below if you are so inclined... but I will also comment when I feel an answer is specifically incorrect and/or incomplete. You've found a great fabric for your project. You need 3 and 1/2 yards of it. When the sales assistant unrolls the fabric, you see that there are three full yards, and a 3/4 yard piece of it, perhaps with a jagged swatch cut from one corner. Do you buy it anyway? How much of it do you buy? What should the vendor offer you (if anything) as an incentive for you to buy it? What factors do you need to consider? What question(s) should you ask? 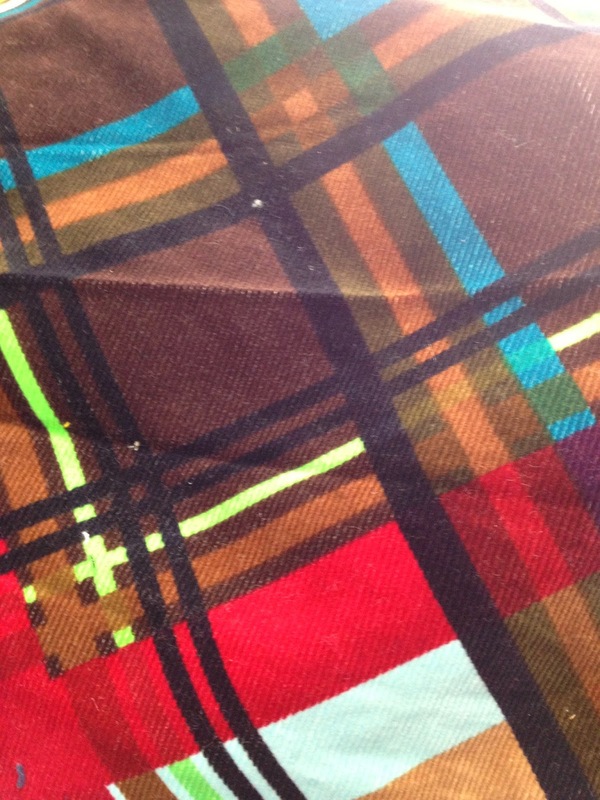 You see a fabric you love, and you are thinking of buying it. You ask for the price. The vendor asks how much you want to buy. What is your answer? 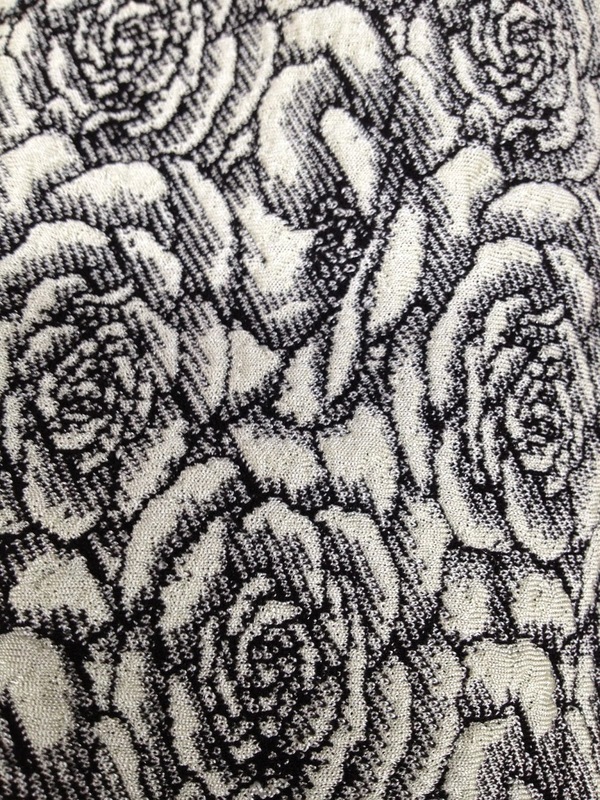 You see a fabric you want to buy. You ask for the price. The vendor hesitates, and then gives a number. What question do you ask next? How would you get a sense if the price quoted is fair? You are thinking of starting a line, or producing something in significant quantity. You want to find the right vendors for your supplies. Where should you start? 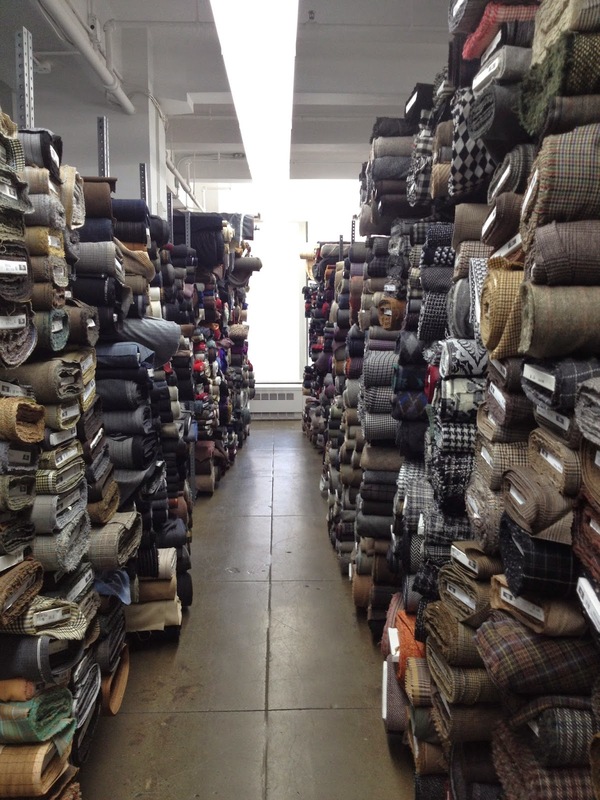 Do you go to your favorite fabric store? Do you go to the Fashion Kiosk? Why, or why not? You want a reversible invisible zipper. Does it exist? You want a two way invisible zipper. Does that exist? You need bra cups for an evening gown. You are between a C and a D cup. Do you buy the cup that may be a bit too large, or a bit too small? Why? You need buttonholes made. How do you mark them? Is there a correct method to get the results you need? What are your options? Where can I get handbag hardware? Once I get it, will I be able to actually make a bag on my own? Why aren't the answers to these questions listed above? This marks 31 years that I've been shopping in the district - and yes, I've been sewing and shopping here since I was a child (not joking), and I've learned a great deal. It is my goal to help you learn a great deal, too! Click here to book a private tour, get a map, or or come on a Speakeasy, and I'll help you learn what you need to know! That store lures me into a fabric-lovin' trance. The staff is patient, knowledgeable and friendly, the layout is roomy and exceptional... with perfect lighting and organization. You just can't beat that. 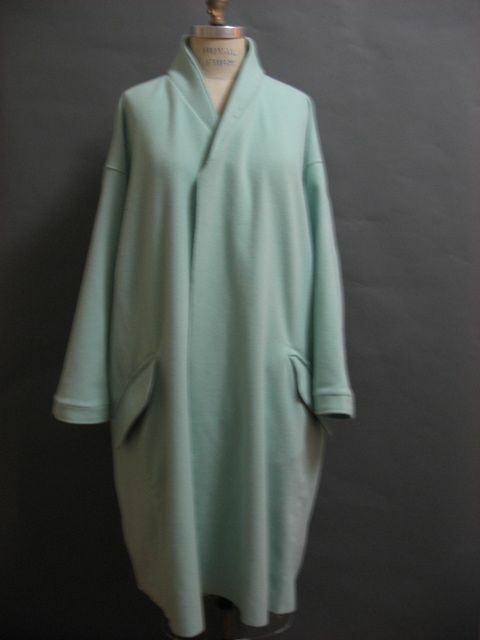 ...to be another Miyake coat, but this time, with black leather edging, and black leather buttons. 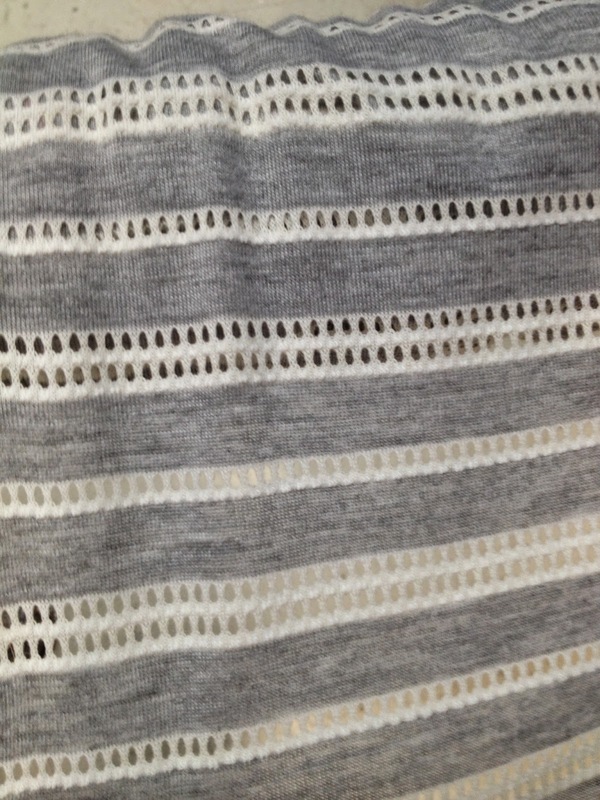 This wonderfully soft stretch knit with eyelet "stripes"
No inspiration photo exists to convey my dream here, as it only exists in my head, but a roomy, bias cut short dress with a drawstring waist and a center front seam, creating a chevron effect, which has to be worn over a snug-fitting singlet dress for modesty. (That's right, I said "singlet".) The singlet would double as workout gear or exertion wear (when worn with a loose T-shirt or tank - I'm not crazy!) for the rest of its lifespan in my wardrobe. This pattern doesn't wanna be interrupted. A long, straight duster style jacket, impeccably fitted and deliberately edged - to be worn over all black or all grey. 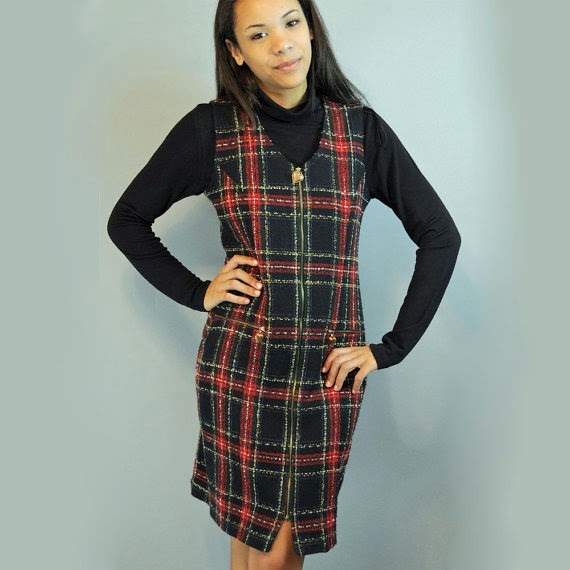 When good corduroy goes "plaid"
This corduroy has its plaid print on the bias, making for some interesting possibilities. And yes, it calls out to be a jumper - can't help it. It just is. They may not be "in style", and maybe they are kinda for kids, but this one would be just for me! No apologies. I generally hate... never mind, no, wait, that is EXACTLY right word - HATE poet's shirts, but this fabric calls out for it. I see white eyelets, laced strings, a delicate placket that stops at bust apex level, roomy, but not "puffy" sleeves, slits at side seams to about 3" above hip level... lemme catch a breeze, and it will just be heavenly, won't it? I'm kinda sick of denim, so I like it when it kinda goes "just wrong enough". Know what I mean? 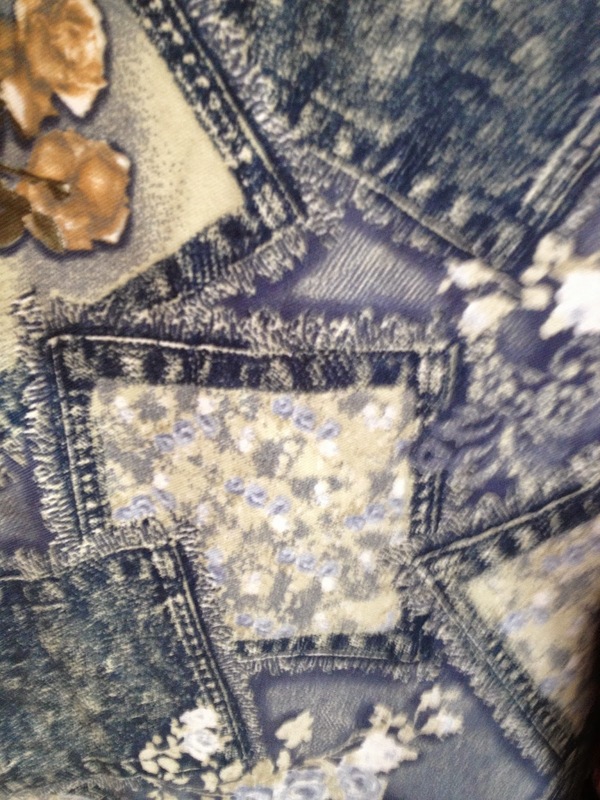 This denim is right on the edge of love/hate for me, in a way that would let me take it in a wild direction. That brown flower tells me that this denim wants to hang somewhere. Maybe not on a body... It should be part of a window treatment, with a brown leather flower crafted by Schmalberg and studs/rivets by Star Snaps involved somehow. Grey flannel - hand me a pocket square... a red one. Cozy and sweet, this "poodle-esque" wool fabric needs to be the simplest of simple cardigan style jackets, worn over a wispy deeper pink/lavender cowl-necked all purpose top. 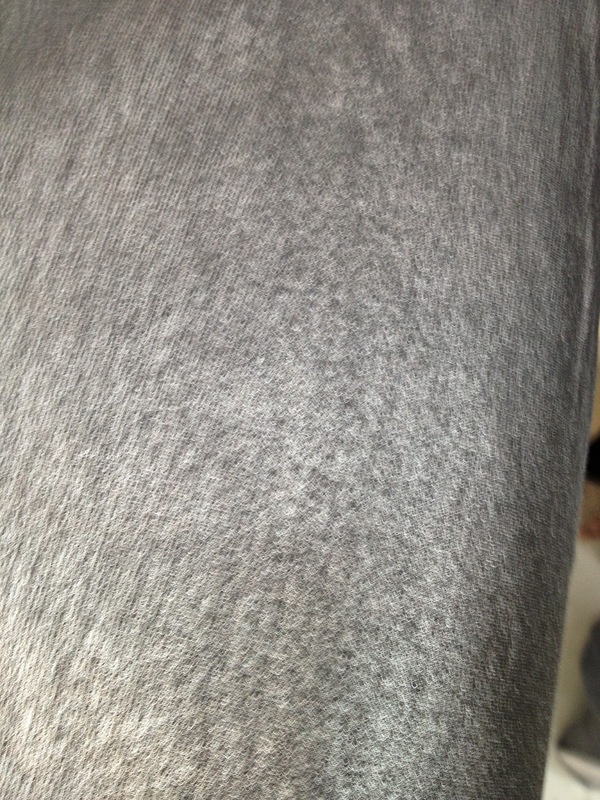 This fabric has "rock star" written all over it. Or for me... Saturdays. I just happen to really like Saturdays. Okay, so this dream needs feathers. Deep green and/or black ones. I'd have to go to Dersh to make that happen. 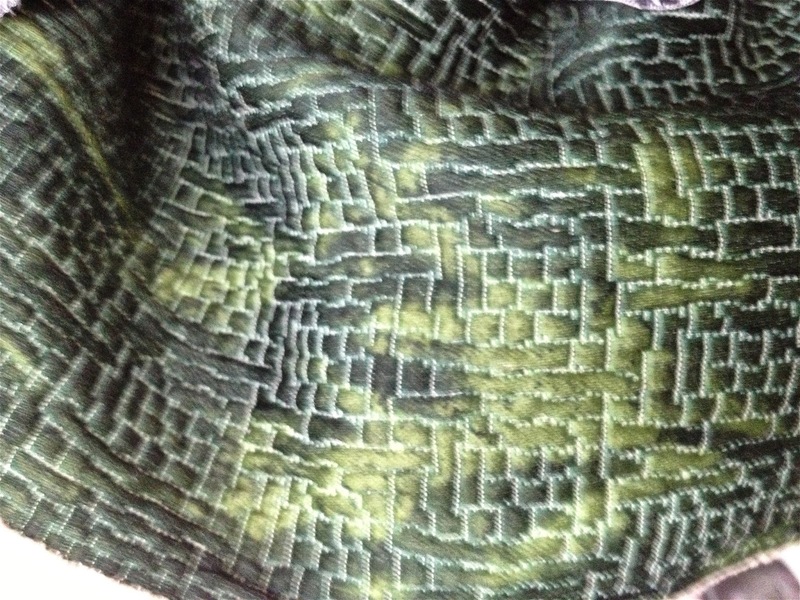 Plus this wild eyelash fabric I found on a recent trip to Leather Suede Skins for the collar. No picture exists, because its still in my head. You know what they say... Talk is cheap. Okay, so now... let's make some fun stuff! Jonathan Embroidery - Where'd ya go? Three of us, strangers to each other, but district regulars, apparently, all did the same double-take before turning around and doubling back to see what was going on. What was once a front crowded window, full of embellished, sparkly things, labels, patches, etc., looked like one large window, with only one entrance to the brightly lit full space, with today's bright sunlight creating a powerful glare. Were they clearing out? On the sidewalk in front of the door, a small sign with orange lettering and a few small arrows, indicating Jonathan Embroidery is still inside! Upon entering the space, you will see that the left side of the store is still going strong, with a long line of people with buttonhole and other specialty requests in their usual position. It seemed the merchandise wall was much leaner. I know the front window had been cleared out entirely. Archer Zippers - Where'd ya go? While in the garment district today, I wanted to check in on Archer Zippers. Guess what? Gone. Checked phone #, no answer. Looked up website. Nothing. Looks like they're gone. If you know something different, let me know! You just don't have the time/energy/skill to make it all happen. "I wanna take a class!" you say. You peruse the offerings of sewing schools, colleges, fashion schools and universities. You ask friends who do amazing work if they will teach you. Sure, on one of those leisurely Saturdays you so often spend lazing around in your spotlessly organized home, with kids, spouses and others so engaged in their own lives, who'll miss you for a couple of hours? Yes, your copious amounts of free time should be spent learning to bead/embroider/knit/design/drape/smock/dye/applique. And, if you're diligent, it should only be a decade or two or three before you're really good at it. My own hand beaded fagotting, cut away from a blouse I made about 15 years ago... I loved it so, but Man, was that time consuming! You can go to an professional, who will do the things that would take too long to do, that you haven't learned to do, or don't have the equipment to do properly. 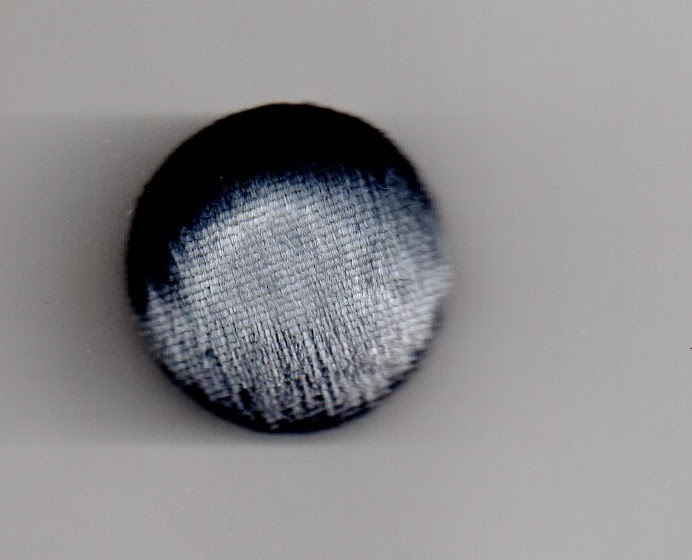 A velvet covered button I had made at B&T Buttons. I could never achieve this smooth, professional quality on my own - and I didn't have to try! A grommet I had applied for me at Star Snaps for my cradle bag. I love the DIY movement. I also love the spirit of the Quilting Bee, DIO (Do It Ourselves).... but I'm also becoming a HUGE fan of DIFM (Do It For Me) projects, as well. My creative brain is endlessly swirling with ideas that may never come to fruition without some very specific help. I have long suffered the curse of trying to figure out how to make something look great while I "figure out" how to do it on my own. Mining the resources of the garment district has really helped me finish many "unfinishables" or long-languishing projects. Believe me, though... my stash is still pretty large, and I've got a long way to go before all of the dreams piled in those boxes, bags and hangers are realized! In a nutshell, stop kidding yourself... either go learn, do, and dedicate yourself to getting things finished, or pay someone who can. I am following my own advice, and I have work to do at this very moment. Check out the upcoming Speakeasies, and get inspired! This post is a continuation of the thoughts expressed in the As Yet Untitled post. 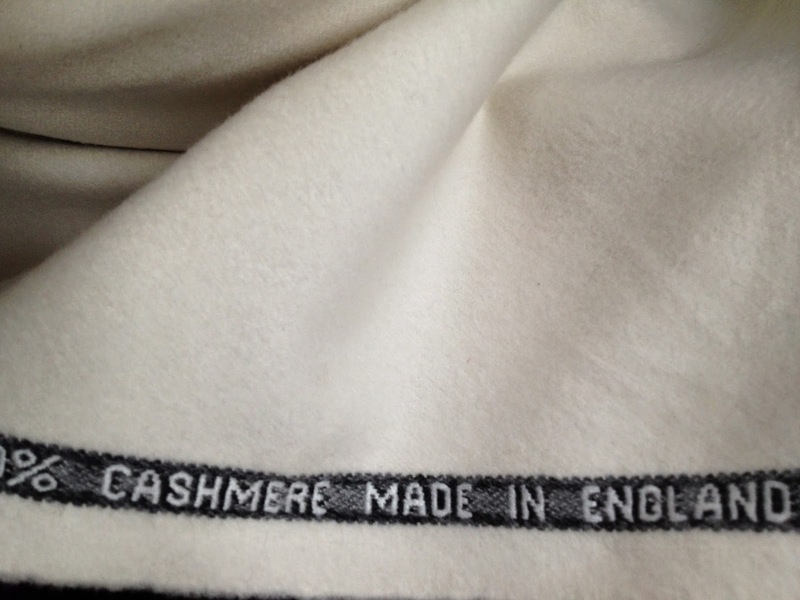 Since writing that post, and reading all of the comments, I have become aware of the fact that many Americans complain about the lack of quality, affordable, American-made clothing, but, if we really care as much as we claim, we would build factories, invest in quality equipment, training and technology, make an effort to gather ready and willing employees, and financial incentives to produce here... but we aren't. Last week, I had the opportunity to meet with the CEO of a company working closely with a large textile and clothing manufacturing company in China. A completely vertical operation, they seek American designers, run custom fabric production using those designers' desired prints, develop and produce those designs in China, and sell those completed designs in Asia, where the market is hungry for American style clothing. Who would say no to this? Labor, fabric, and distribution at a fraction of the cost to produce and try to sell it right here? There is no economic argument for doing it here, unless you produce luxury goods at luxury prices. After running the numbers, comparing an attempt to produce locally with this alternative, I can't see how anyone could argue for trying to do any large-scale production here. And the biggest companies - the very successful ones? they are already moving on to Egypt. Everyone just keeps pushing to find a new frontier. What I learned in this meeting was interesting. The general public wants inexpensive clothing in quantity. It has to be the right clothing for your lifestyle, needs, and budget. Wanna be artistic? Wanna march to the beat of your own drummer? Make things for yourself (if you can do it well, do it, since this is a very economical choice, vs. locally made! ), or, if you are a designer, do small production or truly artistic pieces locally, assuming your products can attract a price that the right customers will pay. On a thoughtful note, read this article about Nannette Lepore, notice that it was written two years ago, and look at this one from a year ago, noticing where the company produces their more intricate items now (15% of production), and noticing what their locally made dresses cost. Last week, I led a custom tour for a former Speakeasy participant, who is now ready to launch a wonderful new clothing enterprise. Having discussed this client's particular needs and interests before meeting, we did a visited a tight group of suitable stores and services that will produce the very specific results this designer is seeking. Wonderfully ambitious and creative, as many new designers are, this particular venture will require some solid industry connections, to consistently achieve high quality results. We explored tools, businesses, and services in the district, and had the pleasure of exploring the New York Embroidery Studio, which was a true visual delight! Embroidery is part of the company name, but only addresses one of the many things they do. A full-service finishing business, they do things you didn't even know were services you could outsource. One-offs or production. Yeah. This company is available for touring and information by appointment only, and you need to be serious (not just curious) to really see the machinery, the experts at work, and closets (upon closets!) of beautiful samples of their work. You could absolutely DROWN in ideas in this place! What inspired me most, mind you, is the thought that you can adorn the simplest of shapes with embroidery, tucks, smocking, beads... that idea of simple clothing as a canvas... You can give them your own artwork to be interpreted into an embellishment that will blow your mind! Now, of course, the company works with many industry names you know, doing all sorts of fabulous creative techniques. The machinery they use is very high quality and vital to the process, but the expertise of the employees who operate the machines and/or work with their ACTUAL hands is peerless. If you want to know more, see their own description of their business here. So, you can use them for a statement piece, a wedding gown, a home dec item, or any project you choose. If you need large production, the process is outsourced overseas. 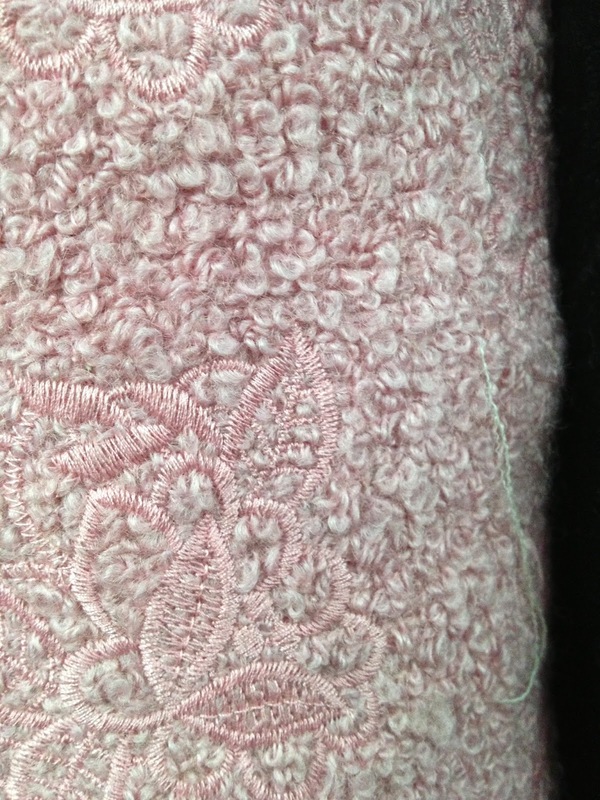 Just visit the NY Embroidery Studio blog to see more of what they do!